Just a quick note to let everyone know we are not still sitting at a truckstop in Misisippi. A day or so after my last post I had a great idea.I decided to post on one of the veggie boards asking if there was anyone near by who may be able to shed some light on our engine problem.A wonderful person named Pat responded that he lived in the area and would come by. Meanwhile Moss continued to tinker in the engine and found that the fuel line had a whole in it and the fuel pump was broken. Pat arives shortly after with his mom and dad following in another car.What wonderful people,to respond to a total stranger on the internet,then drive out to help us ! Anyway, they drove Moss around to get the parts then Pat and Moss installed everything.In a few hours we were back on the road again. We cruised on veggie oil the rest of the way until in Arizona, a truck tire from a nearby semi blew and took out our veggie tank.Sigh..... life on the road,..gotta love it..
We needed to re do major parts of it anyway,most notabley the tank,so it's not to terrible.It's just that now we need to do it sooner,and buy a laptop. I have lots of great pics of our stop in New Orleans and much more,but alas I cannot post them until we get a new computer,sometime within the next few weeks. 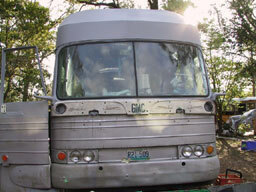 We are in C.A at present,and will be for the next few weeks.Then we need to find a place on this coast to plug in so we can finish our bus work.If anyone out there has a place where we could do that,on the west coast,we would be happy pay for electric and rent for a few weeks.We just need a place to park and an outlet to plug in the saw. We finally left Weeki Wachee Fl about a week ago, ON veggie oil. 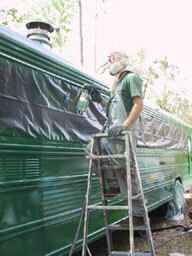 After filling up at the local legion hall on grease ( and getting stuck in the sand,LOL, ) we headed off towards Inverness Fl to visiit with our wonderful new friends Steven and Zeela and to paint our bus. We met Steven and Zeela on line awhile back. 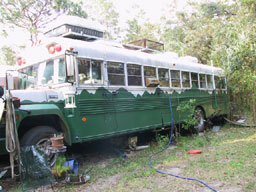 It turns out they were living only about 50 miles from us and were also doing a bus conversion (and trying desperately to get out of Fl).They are actually living in their converted school bus and working on another conversion, a 1969 Greyhound bus.They are doing a real great job on the body work and it is going to look excellent, a real classic.After a few days of painting, fun and hanging out we parted ways (for now) and headed towards Sarasota to say goodbye to my dad and step mom,then headed for the I 75 and California, at last !!! We greased up again outside Sarasota at a Gyro place,then again at a high end restaurant in Pascagula Fl. 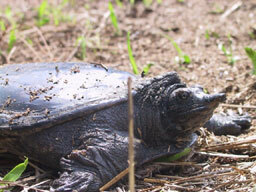 Everyone was real receptive and intrested in what we were doing. At first we thought we found the problem when we noticed that one of the brass shut off valves had been severed due to the engine shaking. Moss replaced it with a steel piece, then changed all the filters, still it will not start for more than a few minutes, on diesel or veggie. Part of me says, "You should have gone with the profesional Grease car systems, you fool! ", it would have been easier yes, it's true, but once we work out these bugs we will have the satisfaction of knowing that we helped create our own system and we will know it inside and out. 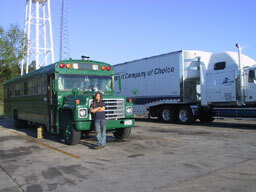 For now though, we sit here, at the Flying jay truck stop in Missisippi, our little green bus tucked in amongst the 18 wheelers and surounded by the strangely pleasant purring of the big diesel trucks all around us. Getting veggie oil from behind the Gyro place. After almost a week of hard work we have finally completed our engine conversion. We actually completed it days ago but it would not run,due to air in the lines, which we have recently fixed. 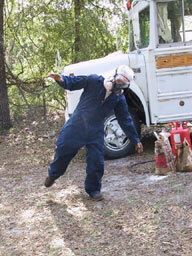 To those of you not familar with the idea of using veggie oil as a fuel source, I will explain here. 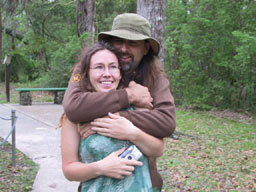 I then pass the torch to the much written of and never yet heard from ,...Moss, my best friend and husband of 11 years. The idea of running diesel engines on vegetable oil is not new. In fact the inventor of the diesel engine, Rudolph Diesel, had originally designed the engine to run off a variety of fuels, most notably peanut oil. In 1898 at the world fair in Paris, Rudolph showed his peanut-oil fueled engine for the first time, much to the astonishment of the public. Rudolph was repotedly very excited about this and very much wanted to provide farmers and small industry a way to make their own fuel . Veggie fuels were used for many years after ,until the 1920s when it was eventually replaced with what was to become known as "diesel" fuel, which is simply a by product of gasoilne. There were also,over the years a few slight modifications made to the original engine that allowed it to run more efiecntly off "diesel" fuel. Despite those changes, today it is still possible to run any diesl engine off of veggie oil.Why would one wish to, you might ask ? First off, it is completely reknewable , produces very little carbon and no sulphur.Secoundly, it is usually free and can be obtained from local restauraunts, who often must pay to dispose of it. So, what modifications are needed and why ? The most important thing to remember is to filter the oil with a 10 micron filter,at least once (especially waste oil) heat the oil first , start the engine on diesel fuel,and end it on diesel fuel.To do this requires two tanks,one for veggie and one for diesel.Although it is possible to simply pour veggie oil into a diesel tank and go,but ONLY on a warm day. In fact,on a warm day you could walk into any grocery store ,purchase a bottle of Wesson and off you go.This is due to the fact that the warm temps causes the oil to thin and therfore flow more smoothly through the engine. For cold weather and long term use however it is neccesary to modify the engine by first heating the oil to a temp of 170 degrees. Moss will be explaining this momentarily. I just want to say that there are many excellent kits available that allow one to convert there engines quickly and easily,and our original intentions were to purchase one of them. However,after thinking it over and talking to a few people,we decided to go it alone,to create,with the help of a friend our "own" system. Our reasons for this were two fold.On one hand we wanted to save money and on the other hand there are some inherent flaws with some of these premade kits,and we felt we could possibly improve on some aspects.
. Our friend Greg, who is experienced with diesel engines and veggie oil conversions,helped us tremendously. Together we have designed a system that we think will work very well, but only time will tell. We would never have tried this without his help,as neither myself nor Moss are very mechanically inclined. This system is by no means complete,we consider it more a work in progress.Although,at present it is fully functional,we do anticipate a period of adjustment where we may need to make some changes as neccesary and as funds become available. Howdy folks, Moss here. I will be getting you hip to the ins and outs of our conversion proccess. As stated by miss Pix, the main thing is to heat the oil to the proper temperature so's it is the right viscocity to flow properly through the engine. To do this we use the coolent. Under normal circumstances the coolent leaves the engine after absorbing as much heat as it can and goes to the heater of the vehicle. From there it makes its way to the radiator,where it is cooled, before going back to the engine where it starts the cycle all over again. 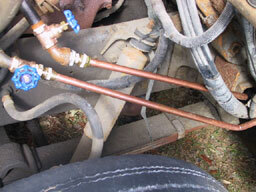 What we did was rerout the coolent through a copper pipe, surounded by a larger metal pipe. As the coolent in the copper tube flows toward the second fuel tank, the veggie oil in the tank flows toward the engine through the larger metal pipe. 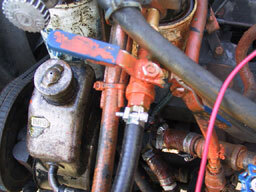 The hot radiator fluid heats up the oil going to the engine. 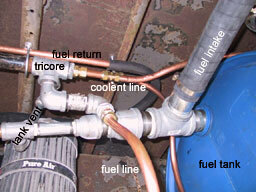 This is called a tri core heating system. In our conversion, we let the coolent in the copper pipe wrap around the tank, this works to pre heat the oil in the tank before it goes on to the "tricore' heater . 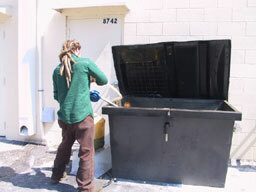 For our veggie fuel tank we used a 55 gallon plastic barrel,not because it is superior to other materials but had the great advantage of being ten dollars,as opposed to say, 400 for a nice metal tank . After the oil leaves the tricore it goes through a 10 micron filter. We used a Golden Rod because you can find replacement filters at any tractor store for very inexpensive. 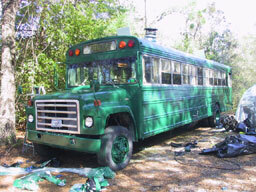 The bus leady has 2 other filters, but since we are usingwaste vegetable oil it is neccesary to filter as many times as possible. You never know what nastyies lurk in used veggie oil. Our system for retreiving the veggie oil from returaunts is as follows; filter the oil as we pump it into a container (curently using a hand pump), then filter it a second time as we pump it into the bus from the container. This way the oil gets filtered 5 whole times before it reaches the engine. That aught to stop the yucks from entering the sanctity of the engine. We decided to go minimalistick on the change over process. This meens that after the veggie oil goes through the filter it goes to a fuel pump and then to a ball valve which you have to manualy pull to allow the veggie oil to flow. 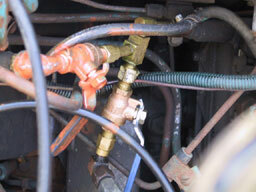 There is a shut off valve before the traditional diesel goes into the engine also. When we want to change over to veggie oil we start it on diesel , wait till it gets hot enough, open the hood , open the veggie valve, close the diesel valve, open the veggie return line valve and close the diesel return valve. We went with the all manual system because we felt that the less coplicated the system, the less to go wrong down the line. Another big motivation was saving money. Return line? What say you of return lines? Well, after the fuel goes through the engine, it does not all get burnt up. The fuel that doesn't get burnt goes through a return line and back to the tank. Many of the pre made conversion kits opt to create a loop and instead of feeding it back to the tank, make it go back through the engine immediately.The Idea is that the oil is already hot so rather than letting it cool off as it goes back to the tank you just put it back into the engine. Greg Makes a good point as why another way might work even better. The idea is this; If you keep recycling the fuel around and round, you bypass the fuel pump and therefore loose preassure resulting in a larger likelyhood of the engine quiting. What we did is this; we ran the return line along side the tricore and the coolent return line. All these pipes are bound together with duck tape and inulated with spray foam along with the tank. We actually haven't got around to insulating the pipes yet ,but because of the tempraure this time of year ,Idon't know if that's to crucial at this moment. 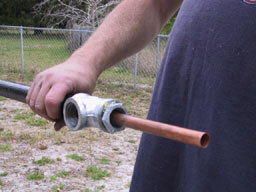 Another diffrence betwixt our conversion and others I have heard of is the fact that we are using copper and steel pipes. Most other kits use plastic and rubber hoses. The use of rubber hoses makes it much easier to put together,but has two draw backs. 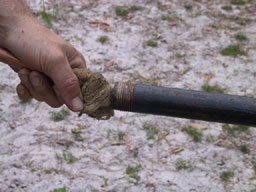 First, the hoses will disinigrate over time. I guess, being that it's so easy to replace, it's not to big of a problem. 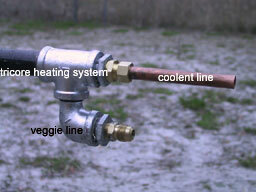 Then again, when the hose carrying radiator fluid deteriates inside the tricore heating system, it can contaminate the veggie oil,which could be catastrophic.The second is that plastic is a poor transferer of heat. With the copper lines, we are heating mutch more efficiantely. 2) Move the on /off valve for fuels in next to the drivers seat.This would allow the driver to switch to veggie or diesel withouit having to pull over and lift the hood. Before I hand things back to back to Miss Pixie,I want to thank Greg Archambault for his help in designing this system. 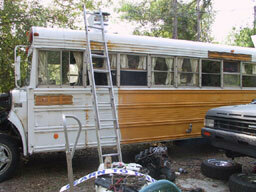 His knowledge of school buses and diesel engines was indespensible and we could not have done it without him. 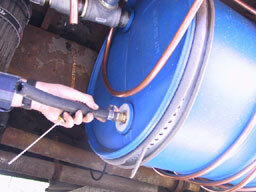 Cleaning the veggie oil fuel line.